Revenues and costs for the 2013 cropping year have now been finalized and are reported in the publication entitled “Revenues and Costs for Corn, Soybeans, Wheat, and Double-Crop Soybeans” available in the management section of farmdoc (see here). Overall, costs increased in 2013 from 2012 levels (farmdoc daily June 3, 2014) and returns were lower in 2013 than in 2012. Projections are for much lower returns in 2014. The “Revenue and Costs” publication has revised measures of returns, as described in this article’s first section. Then, perspective is given on potential changes to 2014 returns projections resulting from information contained in USDA’s Acreage and Grain Stocks report released on June 30th. The “Revenues and Costs” publication on farmdoc presents revenues and costs for producing corn, soybeans, wheat, and double-crop soybeans in three regions of Illinois: northern, central, and southern Illinois. Central Illinois is further divided into categories for high-productivity farmland and low-productivity farmland. Table 1 shows corn and soybean returns for 2012 and 2013 for central Illinois with higher productivity farmland. Table 1 also includes 2014 projections. As can be seen in Table 1, three measures of returns are reported: operator and land return, farmer return, and net farmer profit. Operator and land return equals revenue minus non-land costs and where included in previous “Revenue and Costs” publications. Farmer returns and net farmer profits were not reported in previous publications. As before, operator and farm return represents the return remaining to pay for farmland and to provide a return for the farmer. Division between land owner and farmer is easily illustrated for a cash rent situation. Take an operator and land return of $384 per acre and a cash rent of $290 per acre, as occurred for corn in 2013 (see Table 1). In this case, the land owner is compensated $290 per acre (the cash rent) for use of the farmland while the farmer is compensated $94 per acre ($384 operator and land return minus $290 of cash rent). This farmer compensation is called the “farmer return”, and equals operator and land return minus land costs. In Table 1, land costs equal the average cash rent paid by farmers to land owners. This data is obtained from the Nationally Agricultural Statistical Service. Other means of controlling farmland, such as owning farmland or share-renting farmland, would have different costs than average cash rents. In the publication, farmer return represents the return to cash rent farmland, given that farmland is rented at the average level. Obviously, situations where cash rents are higher than the average level will result in lower farmer returns, and vice versa. From farmer return is subtracted imputed farmer costs to result in net farmer profit. The imputed charges are for the farmer’s equity capital and unpaid labor used in the operation. For example, farmers have equity capital invested in the operation. Interest for this equity capital is included at the current average interest rate on farm debt. Similarly, operators’ labor is valued at the going charge for farm employees. Over time, a farmer needs to cover these imputed costs to provide compensation for capital and time invested in the farming operation. Net farmer profit then equals farmer return minus imputed farmer costs. Over time, net farmer profits must be positive for the farmer to generate positive return for use of his or her resources. If net farmer profit is negative, a farmer could generate a higher return by not farming and investing equity capital in interest-bearing assets whose rate or return equals the average rate on farm debt, and taking an off-farm job generating an hourly wage equal to that of farm employees. Farmer returns and net farmer profit are distinctly different measures of returns. Farmer return is close to an income statement measure of profitability given that farmland is cash rented. Non-land costs and land costs measured by cash rent represent the financial costs of operating and renting farmland. Net farmer profit is lower than farmer return because opportunity costs for equity capital are subtracted. This points out that having a positive farmer return does not imply that a farmer is generating a fair rate of return to capital and labor invested in the farming operation. Average farmer return for corn grown in central Illinois on high productivity farmland was $341 per acre in 2012 and $94 per acre in 2013 (see Table 1). Farmer return in 2014 is projected at -$48 per acre. For soybeans, farmer return was $160 per acre in 2012 and $139 per acre in 2013. Farmer returns are projected at -$52 per acre in 2014. Farmer returns have come down from high levels in 2012 to lower levels in 2013, to negative levels in 2014. Farmer returns like those in Table 1 have been computed for all years since 2000. If 2014 projections hold, 2014 would be the only year since 2000 when farmer returns are negative. Prices used in making projections in Table 1 are $4.20 per bushel for corn and $10.75 per bushel for soybeans. These projections were made prior to the release of USDA’s Acreage and Grain Stocks report released on June 30th. These reports contained information that was bearish for crop prices (farmdoc daily June 30, 2014). Hence, the projected prices may be too high, suggesting that returns contained in the projections are too optimistic. 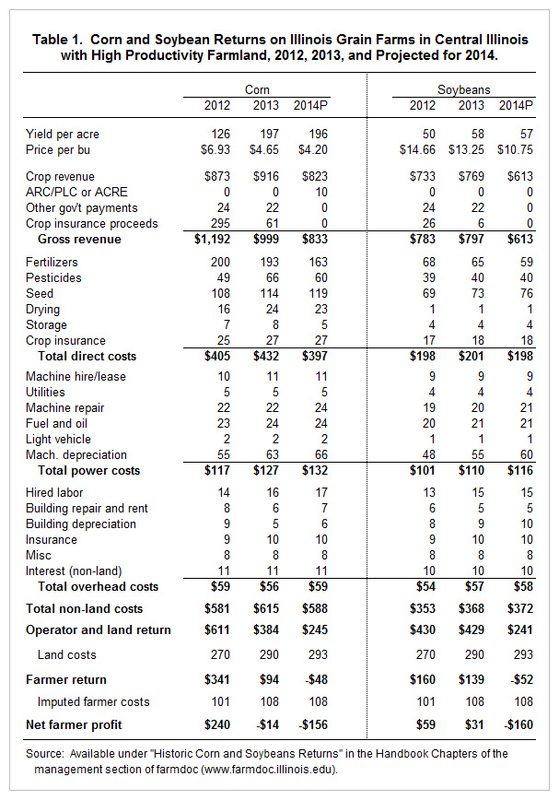 Final costs estimates for 2013 have been released on farmdoc, with a newly designed set or return measures. Returns in 2013 were lower than 2012. Farmer returns in 2014 are projected to be negative in 2014, the first time negative returns occurred in the 2000s. The June 30th reports suggest lower prices, which did not improve the return outlook. Negative returns became a higher probability after the June 30th reports. Projections for 2014 will be updated as more information is revealed on price and yield levels. Good, D. "Large Corn and Soybean Stocks and Large Crop Potential." farmdoc daily (4):121, Department of Agricultural and Consumer Economics, University of Illinois at Urbana-Champaign, June 30, 2014. Schnitkey, G. "Non-Land Costs for Corn Increased in 2013." farmdoc daily (4):102, Department of Agricultural and Consumer Economics, University of Illinois at Urbana-Champaign, June 3, 2014. Schnitkey, G. "Revenue and Costs for Corn, Soybeans, Wheat, and Double-Crop Soybeans, Actual for 2007 through 2013, Projected 2014." Department of Agricultural and Consumer Economics, University of Illinois at Urbana-Champaign, June 2014.